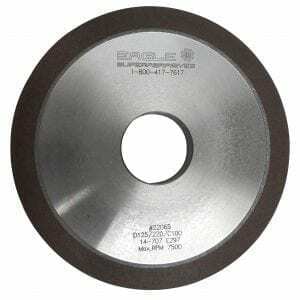 With an extensive inventory of over 6,000 Borazon Grinding Wheel, CBN, CDX and Diamond grinding wheels in stock, Eagle Superabrasives is a premier supplier of superabrasives located in the United States. Ninety-percent of orders are made on location at our Hickory, NC headquarters where orders are ready for same-day shipping. Custom orders can be shipped in as little as seven days. Borazon grinding wheels are quickly taking over diamonds spotlight when it comes to grinding ferrous materials. Borazon CBN is second in hardness only to diamond with twice the hardness and four times the abrasion resistance of conventional abrasives. Borazon Grinding wheels have amazing thermal conductivity properties and provides exceptional removal of material. A borazon grinding wheel achieves optimal productivity when working with high speed steel, tool steel and cast irons with a HRC40 and above. When using Borazon Grinding wheels, they enhance the capability of the machines themselves. The wheels provide increased productivity and higher operating efficiency. Due to their longer wheel life and minimal wear, compared to conventional wheels, machines stay in operation longer between tool changes and need minimal adjustments while in operation. The materials being worked on are also of higher quality when ground with a borazon grinding wheel. It prevents thermal damage all while resulting in better finishes and improved consistency. A Borazon Grinding Wheel is such a great Superabrasive product that the only factor impacting the life of the product is the bond. A breakdown of the bonding layer will cause the Superabrasive to separate from the wheels bond. That’s why our chemist and engineers worked together to enhance the bond of our wheels to ensure that your borazon grinding wheel last longer to increase your savings and decrease your production cost. We offer numerous bond types, to read more about these bonds click here. If you would like to read more about Borazon Wheels click here. When you’re ready to try the best, trust the experts at Eagle Superabrasives. As with our grinding wheels, we offer high-performance customer service that will truly enhance your purchasing experience. Our friendly staff, will provide advice and support along the way answering any questions that may arise. Contact us today!